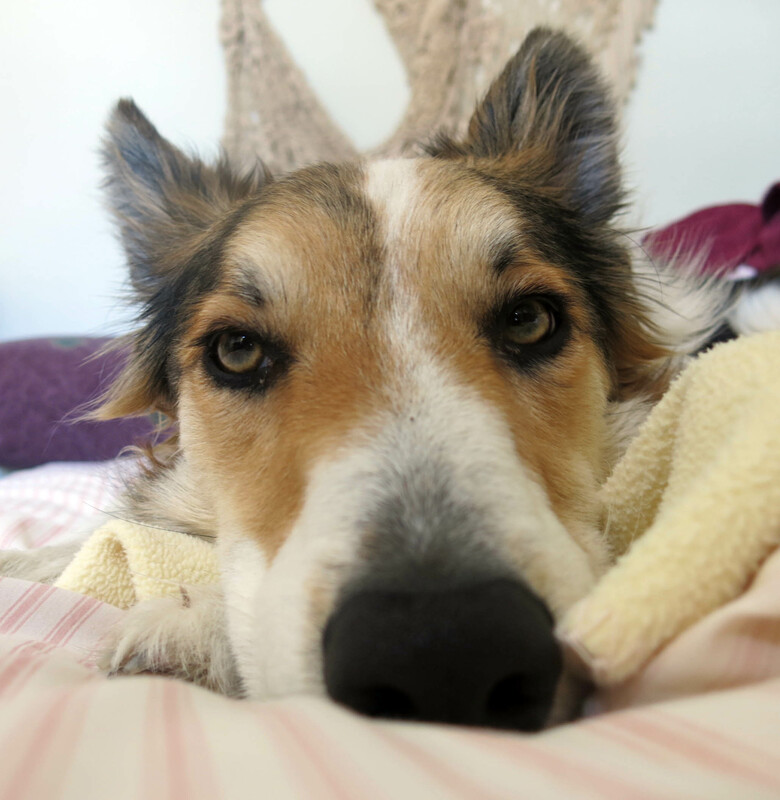 Greetings and salutations, everyone; yes, once again it is I, Mani the not-totally-small purebred border collie, filling in for the extremely gloomy guy I live with, and here to tell you what’s going on right now, which is hardly anything not gloom-related. You may remember me from such gloom-related posts as “Nothing Again Nothing”, among at least a few others. Here I am in a characteristic pose. If I look bored, that’s because I am. This is what our back yard looks like this morning. The guy I live with said we had what was called a blizzard. The guy I live with said he wanted to move to some place where it never, ever snowed, but I know we’re not going to do that. It’s hard to walk in that much snow. The snow is up to my shoulders. I cleared a path for myself, anyway, by leaping and stuff. There are a lot of broken branches. Day Care was canceled yesterday, and today too, so I have to sit around here and listen to the guy I live with talk about snow, giving up gardening altogether, and things like that. 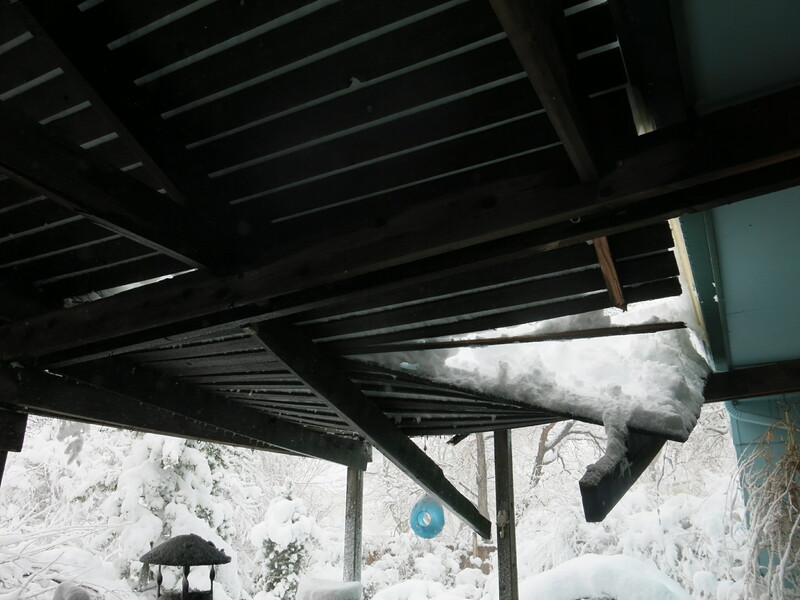 Yesterday, while the guy I live with was on the phone, the patio cover broke. The guy I live with wouldn’t let me go outside until he got all the snow off the patio cover, which involved him putting up a ladder, and raking snow off, and saying a lot of things. It was blizzarding the whole time, too. He made temporary repairs, but says it will have to be rebuilt, or removed, or something. So that’s what’s going on right now. The guy I live with says it’s supposed to do the same thing this weekend. He’s not looking forward to it. He does say there are seeds to be fiddled with, which is strange since he also talks about giving up gardening. This is what I did most of yesterday. That red-and-green thing is the toy I got from Secret Santa, at Day Care. I thought I’d seen cute pictures of you, Mani, but these are the cutest of the cute. You make me drowsy just looking at that sweet-dreams-face of yours. I know how you feel re: snow. It’s acceptable in December; tolerable in January; drop-dead boring in February; dangerously enervating in March; and downright despicable on the cusp of April. Here on Long Island we got a light fall on Sunday night, woke up to a pretty whiteness on Monday morning, and delighted in its total melt-off by 6 o’clock that same day. And if it should DARE to re-appear anytime in the next 4 weeks (that is, anytime in the troublesome meteorological iffiness before May Day), I will wage wrathful revenge on, oh, I don’t know. . . either a Boston creme pie or a case of Pinot Grigio. Thanks; I agree that I’m pretty cute. Everyone says so, so it must be true. The guy I live with says it’s supposed to do this again this weekend, which might be unheard-of, and then again next week. He likes Shiraz, if you wanted to know. 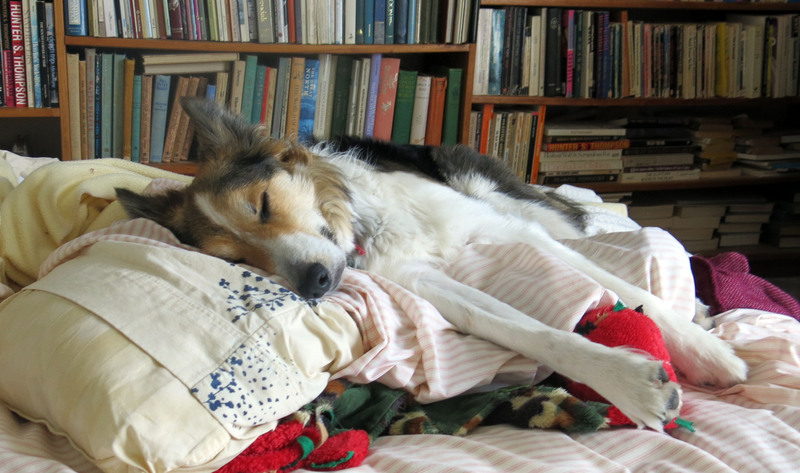 I’ve never gotten any, but Slipper, a purebred border collie who lived here before me, really liked a glass of red wine. One left on the kitchen table very close to a chair, I mean. Well, it looks like ya’ll still have power. Pity the linesmen (er, linespeople) that have to be a’climbin them there poles. Isn’t March the statistical “high point” of Denver snowfalls? Thirteen inches is quite a belly ticklin’ snowfall amount for a not-totally-small purebred border collie, no? Indeed, the guy I live with climbed poles for a living, years ago. March is the snowiest month of the year; April too. Oh my, I think I would be weeping but you guys are made of sterner stuff. I hope the little delights of the garden will be somewhat preserved under all that. Did you lose any important branches? Oh my. OMG! I think I’d be pulling the covers up over my head and pretending it just wasn’t happening! Love the last picture. Touches of Little Red Riding Hood, at least in my old battered picture book, where the wolf takes a nap at Grandma’s house. The guy I live with was doing some pretending, but there are a lot of broken branches, and smashed things, and collapsed things, and snow everywhere. My toy is called a “squeaker mat”, with a kind of caterpillar head. I took out all the squeakers, one by one. That was a lot of fun. ooh ooh, snow, pristine snow, oodles of pristine snow. I can envision you bounding out there, Mani, stomping that snow DOWN. Sleep would then be necessary, of course, followed by lapses into boredom perfectly captured by your first portrait. I mean, perfectly. 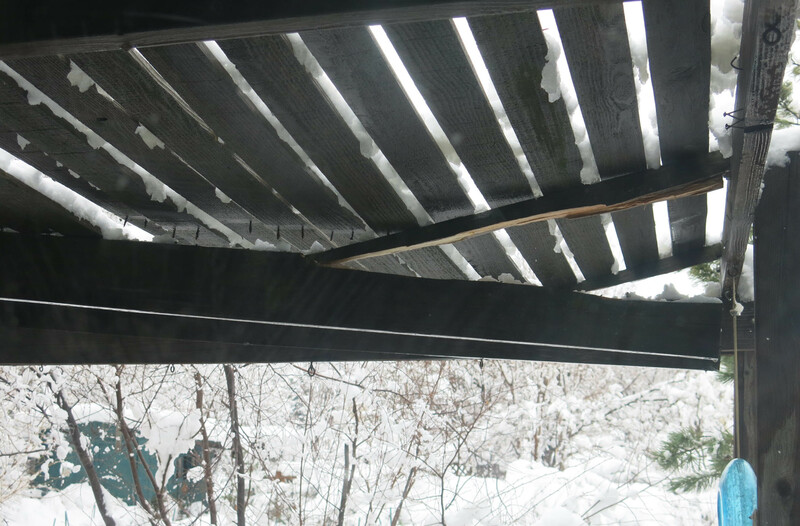 I do sympathize with the guy you live with’s not-glee over the cold stuff and so much of it and with a collapsed patio roof and snapped branches and total icy covering of, you know, snow over all sorts of delicate previously growing things. Still! How neat to be creative in the planning of a new patio roof. And he likes to complain, so when the snow melts he’ll have lots to complain about. I understand snow isn’t rain, but I also understand your current white is *wet* snow. I am curious if your guy continues to define your manor as a “dry” garden. 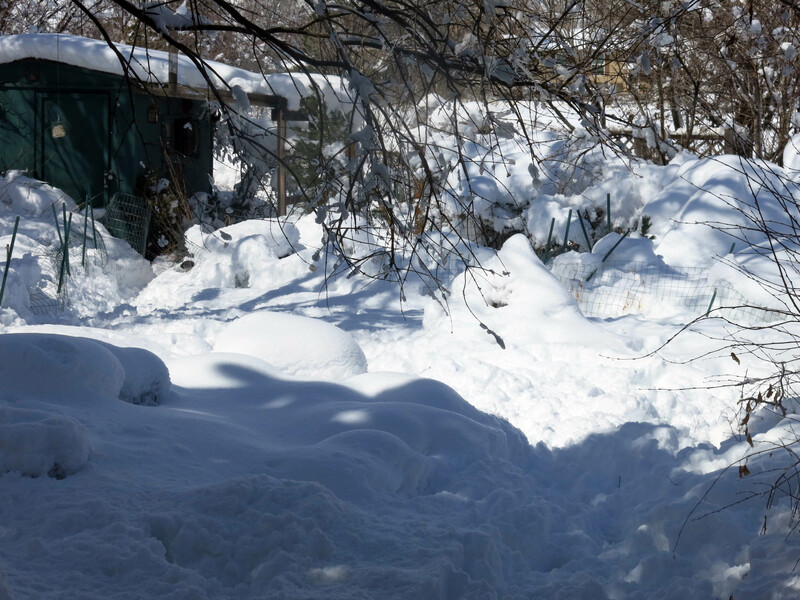 Thanks, though there’s so much snow that I can’t get to some parts of the garden, and there are broken branches blocking my way in other parts. The guy I live with says that the blizzard coming this weekend, and the one predicted for next week, will cover up all the damage. That has to be the cutest report on a blizzard ever! Thanks. Well, I try to be as cute as possible. It’s not hard, you know. Bleck. Now is not the time for back to back blizzards, winter had all of January and February to play that game and now it’s just insulting. Enjoy it while it’s fresh, ignore it as it melts, and April will bring spring back! Thanks, though it isn’t exactly melting …. It’s snowing again. The guy I live with said he’s going to grown only snowdrops, since they flower when the weather is nice (end of January and February). And autumn crocuses too. Thanks, same to you. It’s snowing again here. The patio cover adds insult to injury, dear not-tiny-in-the-least Mani. It appears that you have an instinctive knowledge of how best to ride out a blizzard, however. It’s a good thing there are seeds requiring attention inside so TGYLW doesn’t go stir-crazy! Thanks; I’ve also discovered that racing around like crazy in a foot of slush and mud is a huge amount of fun. Then afterwards, what you do is hop on the bed, especially if there are freshly-laundered blankets and Pottery Barn sheets. Almost all the seeds are sown now, so we’ll see if seeds sown supersede slushy snow, huh?